Ready for some awesome caricature drawing tips? OK then! To start off your caricature drawing, you’re going to want to get some good reference images. [/three_fourths_last]This should always be your very first step when you are trying to draw something because it will help you sort out a lot of things very quickly rather than just exploring through the drawing on your own. To start your caricature just create a circle on the page and then draw a slightly tilted horizontal line across it to get an indication for the eye line. [/one_fourth_last]Try and remember to keep your strokes light, and know that over the course of this drawing video the instructor will be refining his drawing over and over again, so following these example images exactly may not give you the result you are looking for. 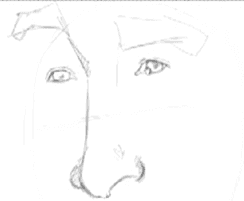 [/one_fourth_last]Also remember that the eyes are one of the most important parts of the face because they can convey so much expression. If eyes are something that gives you problems, then I would suggest taking some time to find and study some good reference so that you can draw eyes like a champ. 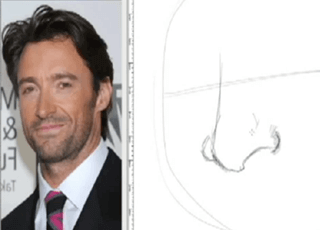 This is probably one of the most important caricature drawing tips, and it’s one of the most crucial things that you can learn to draw. So why bother putting it off? 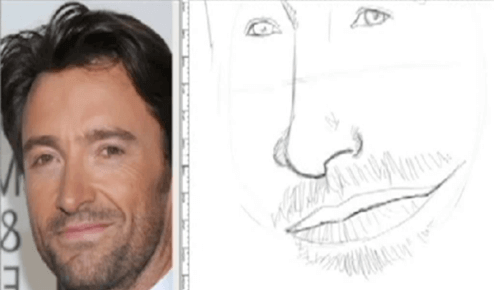 One of the defining characteristics of Hugh Jackman is his stubbly look. His smile isn’t that big in the reference photo, so while we will enlarge the size of the lips and mouth, we’re going to keep that slight smile look from the original photo. This is just the beginning, and over the next 4 lessons you’re going to continue to add and tighten up this sketch to get a really strong likeness happening. We hope you’ve enjoyed our caricature drawing tips so far? If so, we’d love to hear your feedback!